before opening the stats window. To get to this page, go to Leads > Call Logic. If this page is not available, click here for instructions on configuring Call Logic. If a recording is associated with the call, there will be an option to download the call recording. has been added next to each dialing campaign that opens a Campaign Activity Report. The top of the report contains 3 graphs: a breakdown of call time, total and average talk time within the call time, and a breakdown of call results (connected, scrubbed, or other i.e. no answer, busy, etc.). The bottom section of the report displays statistics for each separate dialing session within the campaign. You’re able to restart the session as many times as necessary until there are no more numbers to be dialed. By clicking a number in the “Calls Made” column, you can open a list of all dialed numbers with additional details about each call. The color of Workflow generated appointments now correspond to the type of appointment (phone call, task, etc.). This makes it easier for users to visually identify the type or purpose of the appointment. Additional filters have been added to the schedule to hide or show Workflow and manually created appointments. has been added next to each automatic email that will be sent. Clicking the icon will show the contents of the email template. Emails can be sent on behalf of a specific user. Appointments can be generated for a specific user. History note now contains the appointment description. Substitutions add specific lead data to an outgoing email. To add a substitution to the body of an email, place your cursor where you would like the data to appear in the template, and select the data from the dropdown. 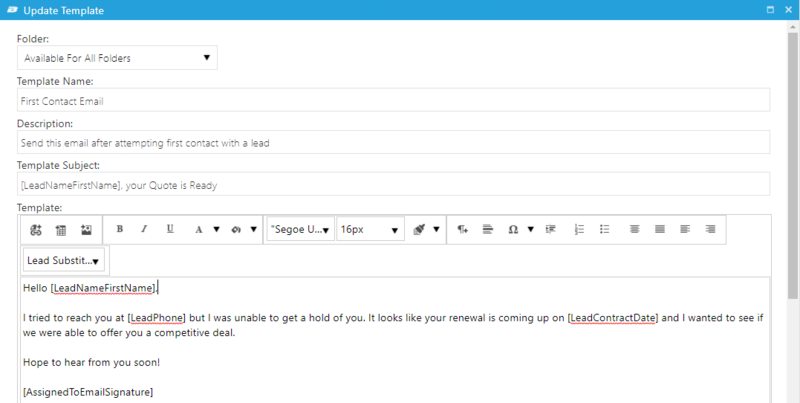 When the email goes out, this value will be replaced with the corresponding lead data. With this enhancement, substitutions can now be added to the subject line. To add a substitution to the subject line, first add it to the body of the email, then copy and paste the substitution to the subject line where you would like it to appear.
. Click either icon to show date and time stamp. The Email Deliverability report is now available for individual leads. To view the report, click “View Email Report” within the Engagement section of the Lead Log. 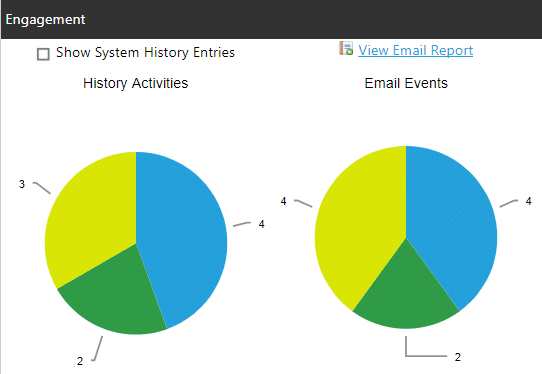 Click on a stat to open up a detailed list of emails. Email type filter – To hide or show emails that are a specific type, use the check boxes above the list. icon to view the URL(s) clicked. The checkboxes next to leads on a list are used to apply specific actions to the selected leads. An enhancement has been added allowing you to select all leads on the list, as opposed to the displayed leads on your current page. 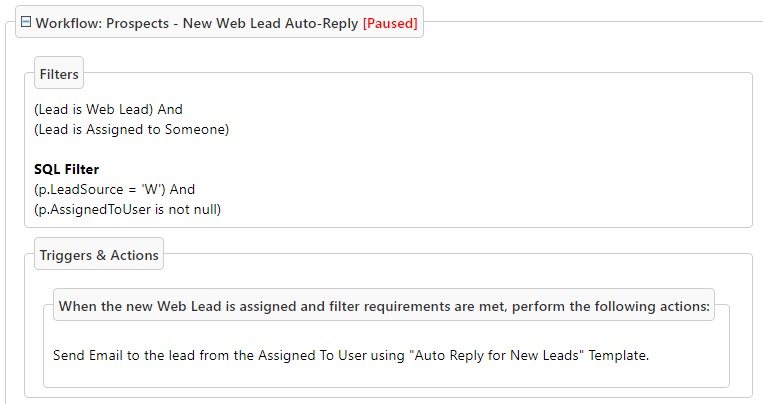 When the top check box is clicked to select all on the page, a yellow message will appear above the list giving an option to select all leads in the list. Once all leads are selected, you can apply an action to the leads using the “Select Action” dropdown on the top left of the list. This field corresponds to the “Last History Date” by displaying the action that was performed on that date. To view this column, click “Column Options” on the black bar above the list you’re viewing. Each web lead provider that is currently configured will be listed next to the provider’s name. Workflow is now used to send out confirmation emails, so this option has been removed from the Web Lead Configuration page. has been added to the Web Form setup page, next to the Folder name, that opens the configured Folder’s custom field settings.